Volkswagen Bus Samba Camper Van Ornament - Set of 3. NOVA68 exclusive Classic Hand-Crafted Christmas Ornament in Blown Glass with Hand Decorations. Price includes 3 (three) VW Samba Bus Ornaments. Keep one for yourself or give them as gifts to family & friends. They make the BEST Christmas Gift ever; everyone loves these! Get ready for the wide open road with the NOVA68 Volkswagen Bus Samba Camper Van Ornament. 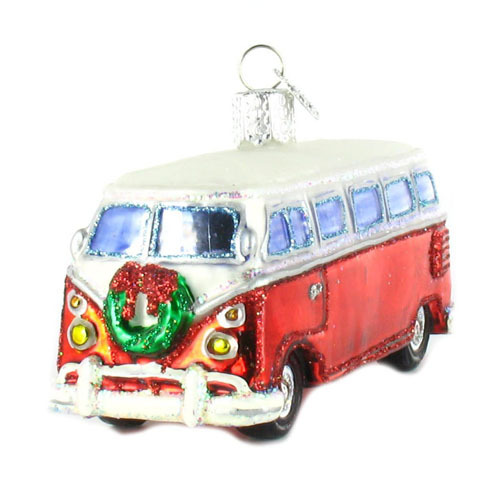 Our classic VW Bus Christmas Tree Ornament evokes the iconic style of the 1958-67 Samba Camper Van, aka the Volkswagen Bus / Volkswagen Camper / Volkswagen Delivery Van. This popular VW Van Christmas Ornament is hand-crafted by master glass artisans from blown glass and features unique hand-decorated accents. Each VW Bus ornament is made according to age-old traditional glass blowing techniques that originated in the 1800's. Each ornament is hand-painted and glittered in a series of labor-intensive steps to achieve the beautiful color variations as shown. Our classic VW Samba Bus makes a great gift idea!